गरीब डोंगरी संघटना (GDS)Barring a few remote villages, by and large, singing songs of one’s composition while grinding disappears as a living performance in Western Maharashtra. Still the creative capacity that carried that tradition is not altogether extinct neither its communicative potentialities. It is worthwhile in this respect to make a content analysis of a set of twenty seven songs composed and enthusiastically sung during a two-day meeting organised by the association of the Poor of the Mountain for forty five deserted women in March 1997 on the occasion of the international Women’s Day celebration. To facilitate the self-reflection of the group and create an atmosphere congenial to sharing personal life stories, I composed distichs meant to link up the words, speech and tunes of yesterday with the present experience of the participants. The latter are women who without fault on their part, are rejected by their husband or in-laws for selfish purposes only. Though the particular condition of their elders was not one of desertion, all have a lot in common to share. Nevertheless our attention is not drawn towards that commonality but towards the tradition of songs as an asset of communication (an input medium) in the particular context of a collective self-introspection exercise undertaken by a group of deserted women from Pune district (mainly Shirur taluka) in Maharashtra. Out of about 325 words or so, among those three which occur most often (in direct form and otherwise) to denounce an unjust male behaviour, the first one is papi, ‘sinner’, occurring in nine songs. The word had been extensively used in the tradition of songs with the meaning of sexual aggression of which the victim will bear the dishonour and severe consequences as a social stigma. The present songs proclaim the women’s innocence and point to the misdeeds of the actual miscreants. Their connotations extend to various sorts of sexual abuses and injustices meted out to innocent women. They are meant to clearly denounce, rebel against and call for retaliation in words and further on in practice: this is what deserted women can and should nowadays do without fear. They should realise that there is a sort of ‘plot’ hatched by sinners with a treacherous mind against them noble women born from the womb of their mother and father of good repute. The cow is here the emblem of a woman on account of her simplicity, innocence and unselfish nature, qualities which make her an easy prey to selfish interests of males. In the deep forest how did you ill-treat the cow? Eh! you sinner, you have no pity for her. How many girls who did nothing wrong have you killed? I keep on record in my memory the date of wedding. In one day, I’ll hold them all upside-down. Oh! you sinner! a villain, with whom are you playing fool? I am not a gentle woman, I’ll hang you at the village wall. A man kills for dowry, this is not a man but a villain. The villain has gossiped against her without her committing any fault. The third word of a wide occurrence is kapati, deceitful, treacherous. It occurs in six songs. Man is unfaithful, deceptive, unreliable. Society lets him loose at the cost of women: “Do hatch your stratagems, we shall bear the grief of your treachery,” quips sarcastically a song. How did he not show pity for a woman’s life. Eh! deceitful man, your existence, who gave it to you? You, treacherous men! your mind is prejudiced. A woman’s name pushed in the forefront makes your blood run cold. Four other qualifications apply to men’s behaviour. Cancal, fickle, inconstant in loyalty, occurs in two songs which focus in this respect on the sight of men who look around for girls and make eyes at them. They ‘play games with their eyes’, their ‘mind is burnt caught in the glance of girls’. A song warns them ‘not to wander off at the sight of young girls’. A woman with no injustice, they burn her alive. Third characteristic feature: use of women for continuation of male supremacy only. 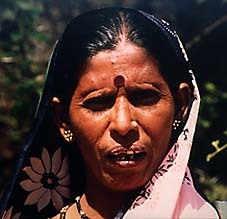 A woman may be addressed as a Lakshmi, this is on account of no consideration for her personality. A song places sarcastic warnings in the mouth of the husband to that effect: marriage is only meant for lineage maintenance, viz., to obtain a son. When will the lamp of the lineage be in your womb? As a consequence, a woman can only feel frustrated by a male partner acting important and concerned with power only, when she expects consideration and affection in return for her love and is to get none. — How much affection though I feel for you, you distinguish yourself with the opposite. Fourth male attribute: violence. Four songs explicitly denounce male harmful aggressiveness. Unwilling to protect his sister who already has to bear with a co-wife, a brother hands both of them over and gets rid of them. Compared to a useless stem of millet which can not carry ears, his insensitivity turns him into a murderer. The sister in the song equates him to a butcher who wrecks women’s life. Brother gives sister and co-wife, this is no brother but a butcher. A second song refers to the cycle of Krishna whose Kamsa, mythical king of Mathura, is the maternal uncle. Following a prophecy announcing that one of the sons of Devaki his sister will kill him, Kamsa tries to kill all her sons lest one of them should make the prophecy come true. The maternal uncle, mama, is usually playing the role of a protector of his sister and sister’s children, in particular the weakest ones, like a niece; he holds a key role especially in the decision and celebration of their marriage. In the song this male privilege proves fatal and murderous as in the case of the child Krishna, Devaki’s son, whom Kamsa tries to kill. No hope for the niece, this is no mama but Kamsa. It’s a real black cobra with feet in the belly. His race is not a naive breed, he cuts a throat with hair. Our detailed analysis of a reactivated performance of the grindmill songs prompts us to underscore five distinctive aspects specific of that process of reactivation of a traditional form of communication. The effectiveness of the communication process rests upon the strength of words. None of them is casual. Syntax on the other hand may remain the simplest and shortest possible, conspicuous by its irrelevance as a determinant linguistic asset. The elementary poetic elements such as rime, rhythm and caesura enhance the phonetic value of the words and stress their semantic effect. Words are powerful on account of two characteristics: genuine simplicity and symbolic import. All of them are most common words borrowed from the every day lexicon of the common man. They always refer to concrete realities. There is not a single abstract or ideological word as one may find in the usual militant songs of any action-group. The latter’s aim is didactic and makes a great use of key concepts. The main objective of our songs is neither didactic nor informative. A symbolic logic defines their cognitive regime. They use no concepts nor allegories but go by feminine common sense. Their reference is only woman’s experience as spontaneously perceived and judged. The oral text is to be sung. The musical performance can not be dissociated from the text. The traditional images, words and representations are updated, viz., related to present practices. Two features define this referential shift. There is a semantic affinity or homology between the traditional term and the present experience. The past mirrors the present. Basic experience is the same. As a consequence the shift towards a present referent is but natural, spontaneous and genuine. Traditional idioms link up without discontinuity to the present. Tradition stands as a milieu of knowledge and a system of communication. This explains for its efficiency to transform the present. Last but not least, a critical inflexion gives bite to traditional idioms which certainly lamented for ill-treatment and harassment but lacked punch to fight back and clearly claim another justice. The present empowers the past idioms. Critical awareness instils a new breath into them. They enjoy a new span of life. The past mirrors the present, the present makes the mirror forcefully implode.